I apologize for the delayed post, for as you know, I have been quite busy with my new Prusa printer. It has been a bit of a rocky road to start, but I’m still really excited for what this printer has in store for me and all the great things I’ll print in the future! So I’m going to give a step-by-step of my first few weeks with it- hopefully this will give insight to other users on some common issues. So here is where my issues begin. First issue was, as some of you may have guessed.. an extruder clog. To those of you who have never used a 3D printer, an extruder clog is one of the most common issues with 3D printers. A clog is never a quick or easy problem to resolve. I first noticed the clog when trying to load the filament for the very first time. I was quite frustrated, as I hadn’t even printed anything, but this ultimately became a very vital learning experience for me and I’m glad I had to go through it. I decided to resort to both Google and Prusa customer service, since at this point I had no idea how to remove the clog. 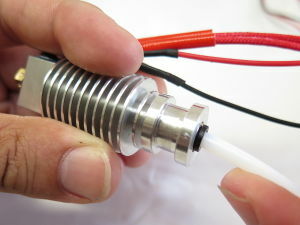 I found this article, whose author had a very similar clog to mine- he ended up taking apart his extruder. I was hesitant to do so, as I had purchased my printer assembled and had no background in the mechanics of the printer. However, Prusa customer service got back to me and said the same thing; I would have to take apart the extruder to clear the clog. They provided video instructions on how to disassemble the extruder, which helped me greatly and, yes, led to me removing the clog. Here are the links to those videos (1 and 2) if anyone else runs into a similar clog with their Prusa MK2S printer or E3D V6 hotend. Firstly, it was really just unscrewing the motor, two fans, and housing, without damaging any of the wiring. Thankfully, soldering the wires worked and the fan powered up as I booted up the printer. And we are back in business! Everything calibrated fine and I was able to begin printing. I’m hoping to get this fixed relatively quickly, and am cautiously optimistic due to my victory over the Battle of the Clog. WISH ME LUCK! A big shout out to the customer service over at Prusa Research and to my boyfriend, who put up with my cursing and helped me unscrew the hotend/solder the fan! Great you were able to fix the clog! i am into 3D printing service and i understand when print does not come out well it gets pretty frustrating after so much time invested in it.